In the NFCC’s September online poll of more than 1,400 individuals, 24% of the respondents said that they wouldn’t inform their spouse if they were experiencing financial difficulties. Among the reasons for not speaking up were fear of worrying the spouse (9%), because the spouse isn’t aware of the debt (8%) and fear of damaging the relationship (7%). Having the conversations necessary to talk about troubled finances is extremely difficult. 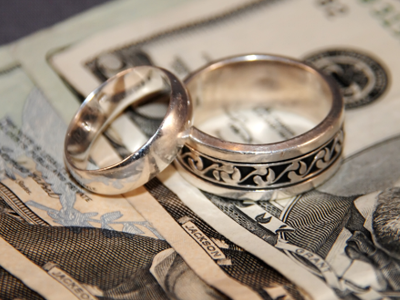 I’ve offered our Seven Financial Rules for Marital Bliss, and a five part series on how to get out of debt. But getting your finances in order takes more than knowledge. It takes motivation. And I’ve seen little that is as good as Dave Ramsey’s Financial Peace University. Find a Financial Peace University (FPU) class near you. The cost is currently $99 which includes a Lifetime Family Membership. Only one Lifetime Membership is required per family. Your Lifetime Membership includes all of your required class materials and gives you and your spouse the ability to take FPU anywhere, anytime and as many times as you like! The payment is important. A couple that won’t pay the money, won’t benefit from the program. A couple that won’t both attend won’t benefit from the program. But couples who pay and attend all of the lessons will begin the difficult process of behavior change. Attendance has to be long enough for behavior change to begin. And that is another benefit of the Lifetime Membership. Many successful couples take the class twice and then help lead and facilitate their third session. The group social discussion with others who are also struggling with their finances provides a safe environment for open and honest discussion. Preview a class now to feel more comfortable before you sign up. Nothing is harder than behavior change, but Financial Peace University gives one of the best chances of getting your finances – and your marriage – in order! Get help before you give up.